Born at Bordeaux about 354; died 22 June, 431. He sprang from a distinguished family of Aquitania and his education was entrusted to the poet Ausonius. He became governor of the Province of Campania, but he soon realized that he could not find in public life the happiness he sought. From 380 to 390 he lived almost entirely in his native land. He married a Spanish lady, a Christian named Therasia. To her, to Bishop Delphinus of Bordeaux and his successor the Presbyter Amandus, and to St. Martin of Tours, who had cured him of some disease of the eye, he owed his conversion. He and his brother were baptized at the same time by Delphinus. When Paulinus lost his only child eight days after birth, and when he was threatened with the charge of having murdered his brother, he and his wife decided to withdraw from the world, and to enter the monastic life. They went to Spain about 390. At Christmas, 394, or 395, the inhabitants of Barcelona obliged him to be ordained, which was not canonical as he had not previously received the other orders. Having had a special devotion to St. Felix, who was buried at Nola in Campania, he laid out a fine avenue leading to the church containing Felix's tomb, and beside it he erected a hospital. He decided to settle down there with Therasia; and he distributed the largest part of his possessions among the poor. In 395 he removed to Nola, where he led a rigorous, ascetic, and monastic life, at the same time contributing generously to the Church, the aqueduct at Nola, and the construction of basilicas in Nola, Fondi, etc. The basilica at Nola counted five naves and had on each side four additions or chapels (cubicula), and an apsis arranged in a clover shape. This was connected with the old mortuary chapel of St. Felix by a gallery. The side was richly decorated with marble, silver lamps and lustres, paintings, statuary, and inscriptions. In the apsis was a mosaic which represented the Blessed Trinity, and of which in 1512 some remnants were still found. 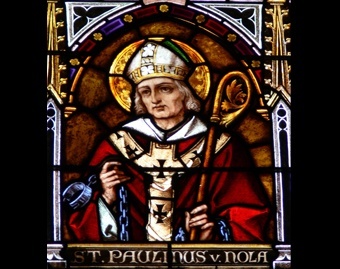 About 409 Paulinus was chosen Bishop of Nola. For twenty years he discharged his duties in a most praiseworthy manner. His letters contain numerous biblical quotations and allusions; everything he performed in the Spirit of the Bible and expressed in Biblical language. Gennadius mentions the writings of Paulinus in his continuation of St. Jerome's "De Viris Illustribus" (xlix). The panegyric on the Emperor Theodosius is unfortunately lost, as are also the Opus sacramentorum et hymnorum", the "Epistolae ad Sororem", the "Liber de Paenitentia", the "Liber de Laude Generali Omnium Martyrum", and a poetical treatment of the "De Regibus" of Suetonius which Ausonius mentions. Forty-nine letters to friends have been preserved, as those to Sulpicius Severus, St. Augustine, Delphinus, Bishop Victricius of Rouen, Desiderius, Amandus, Pammachius, etc. Thirty-three poems are also extant. After 395 he composed annually a hymn for the feast of St. Felix, in which he principally glorified the life, works, and miracles of his holy patron. Then going further back he brought in various religious and poetic motives. The epic parts are very vivid, the lyrics full of real, unaffected enthusiasm and an ardent appreciation of nature. Thirteen of these poems and fragments of the fourteenth have preserved. Conspicuous among his other works are the poetic epistles to Ausonius, the nuptial hymn to Julianus, which extols the dignity and sanctity of Christian marriage, and the poem of comfort to the parents of Celsus on the death of their child. Although Paulinus has great versatility and nicety, still he is not entirely free from the mannerisms and ornate culture of his period. All his writings breathe a charming, ideal personality, freed from all terrestrial attachments, ever striving upward. According to Augustine, he also had an exaggerated idea concerning the veneration of saints and relics. His letter xxxii, written to Sulpicius Severus, has received special attention because in it he describes the basilica of Nola, which he built, and gives copious accounts of the existence, construction, and purpose of Christian monuments. From Paulinus too we have information concerning St. Peter's in Rome. During his lifetime Paulinus was looked upon as saint. His body was first interred in the cathedral of Nola; later, in Benevento; then it was conveyed by Otto III to S. Bartolomeo all'Isola, in Rome, and finally in compliance with the regulation of Pius X of 18 Sept., 1908 (Acta Apostolicae Sedis, I, 245 sq.) was restored to the cathedral of Nola. His feast, 22 June, was raised to the rank of a double.